Murex is a global leader in trading, risk, and processing solutions for capital markets. Since its creation in 1986, the company has enabled its clients to make better informed trading decisions, improve operational efficiency, and enterprise risk management while controlling technology costs. Murex has clients in many sectors, from banking and asset management to energy and commodities. The robust and modular MX.3 solution is harnessed by institutions across all market segments to enable business growth and innovation by accelerating their technology transformation. Murex customers can leverage AWS services to ensure they have a resilient, secure, and highly performant MX.3 platform on AWS. For example, by using AWS Application Auto Scaling groups combined with Amazon CloudWatch events, they can achieve a higher availability of the platform. With minimum effort, Amazon Relational Database Service for Oracle multi-AZ capability improves MX.3 database resiliency across several availability zones. For ease of deployment, custom AMIs can template and package MX.3 environments to provision testing and development environments faster. 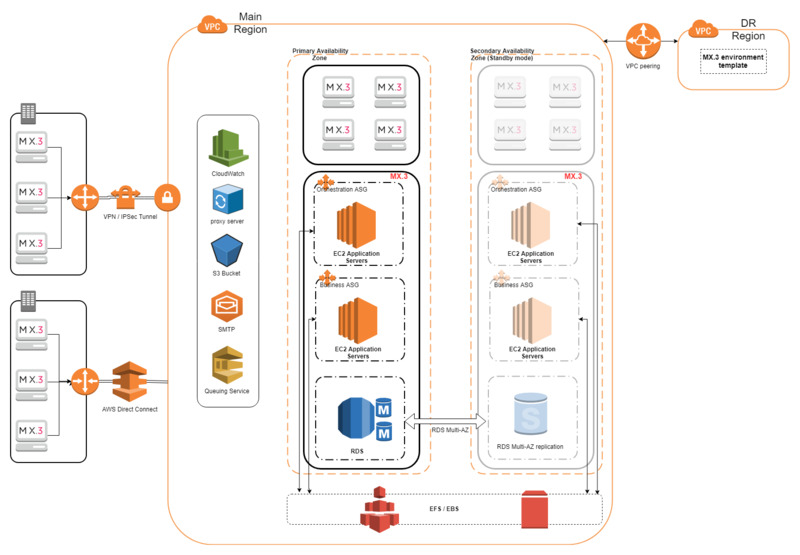 To get up and running on AWS infrastructure, Murex clients first need an MX.3 application package from Murex after which they can provision the required infrastructure on AWS. Once aligned with the Murex best practices, clients can deploy and verify the MX.3 installations, and run the application.